Could Subaru finally be bringing a more powerful BRZ to life? The Subaru BRZ and its Toyota twin are engineered to be enthusiast heartthrobs in every division except one: the horsepower department. 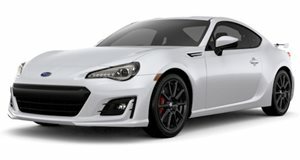 The BRZ weighs less than 3,000 pounds and is a wonder in the corners, but with only 205 horsepower coming from a 2.0-liter flat-four, it leaves drivers with a desire for more oomph. A spy photographer for Autoblog caught evidence that Subaru agrees with that sentiment after spotting a factory-tuned BRZ wearing manufacturer plates, camouflaging tape, and STI badges. The fact that this prototype was caught driving around Subaru’s offices in Ann Arbor, Michigan only adds to its credibility as a manufacturer test vehicle, and that makes us very excited. Rumors of a Subaru BRZ STI that’s been turbocharged to make up for the horsepower deficiency have been circulating even though the automaker told us that it’s simply not happening. Those rumors likely first emerged out of enthusiast hope and the fact that the BRZ is the most obvious candidate in Subaru’s lineup for an STI upgrade, but the STI badges on this coupe tell us that Subaru may have lied about the whole no BRZ STI thing and we couldn't be happier. The hardware upgrades include a large rear wing, side skirts, light but aggressive fascia adjustments, and Brembo brakes seen behind the wheel spokes. The wing is reminiscent of the Japan-only Subaru BRZ tS by STI, but that car came with no power upgrades and amounted to little more than a standard BRZ with a handling and appearance package. Unfortunately, there is not enough evidence to prove that Subaru has a major power upgrade planned for this BRZ STI. No hood bump or wide air vents that would confirm claims of expected forced induction hardware can be seen here, though Subaru could be in the process of driving an early test mule that hasn’t had the hardware added. So far the upgrades only signify that we’ll see a handling package added to the BRZ. Though we’d welcome any kind of performance upgrade with open arms, what we really want is an end to this horsepower drought. Maybe Toyota is afraid more power will eclipse the upcoming Supra?